You may opt out or contact us anytime. Is Empathy the 20th Century’s Most Powerful Invention? The Arts Don’t Need New Audiences. They Need Communities. Was Sweden Ever a Model Society? Why Do Americans Still Love It’s a Wonderful Life? What Does War Look Like in the Cyber Age? Do Sanctuaries Really Bring Peace? 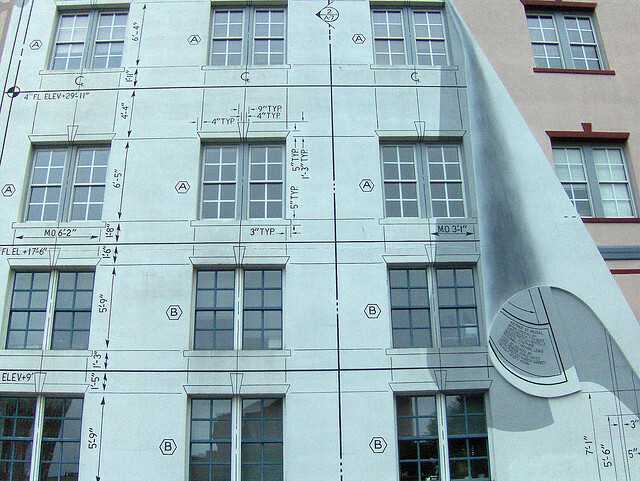 Architecture Does Matter—Even In Crazy L.A.
We accord both architects and their buildings celebrity status, but how much do blueprints ultimately influence the way we live or the way our cities develop? Architects, planners, designers, and scholars visited Zócalo at the Getty Center to participate in three panels exploring how architecture has shaped—and will shape—the world and Los Angeles today. 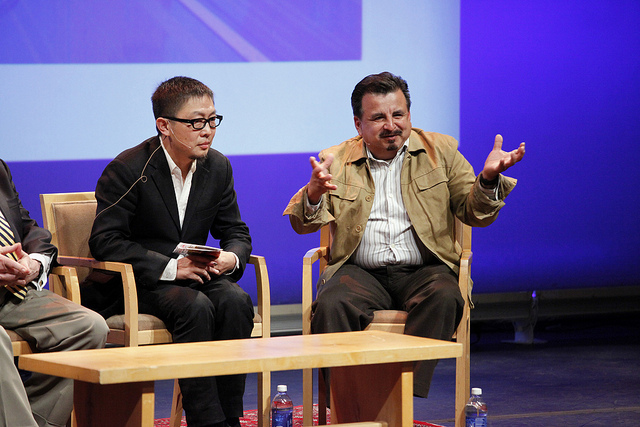 The half-day Zócalo/Getty conference, entitled “Does Architecture Matter?”, was part of Pacific Standard Time, an initiative of the Getty with arts institutions across Southern California. 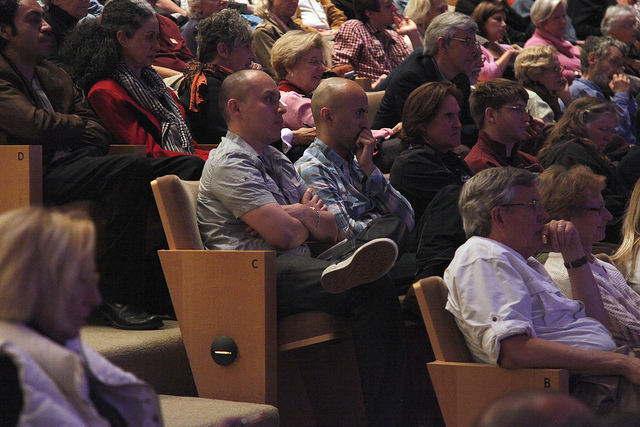 A capacity crowd packed into the Harold M. Williams Auditorium, spilling over into a nearby simulcast room, to hear a group that included architects Thom Mayne (founder and design director of Morphosis), Qingyun Ma (dean of USC’s School of Architecture), San Francisco Chronicle urban design critic John King, photographer and sociologist Camilo José Vergara, and Blade Runner designer and visual futurist Syd Mead. Do Architects Really Shape Cities? Great buildings can define a cityscape, but how much do the grand plans of architects influence daily life? 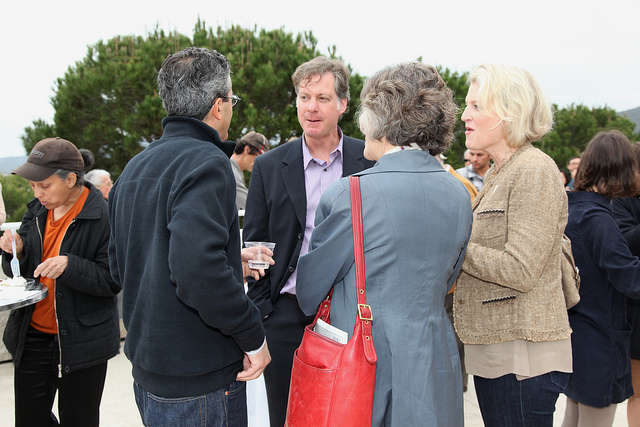 During a panel moderated by San Francisco Chronicle urban design critic John King, no one could agree on an answer. But everyone acknowledged that one of the big challenges facing architects and planners today is keeping up with the pace of a rapidly changing world. 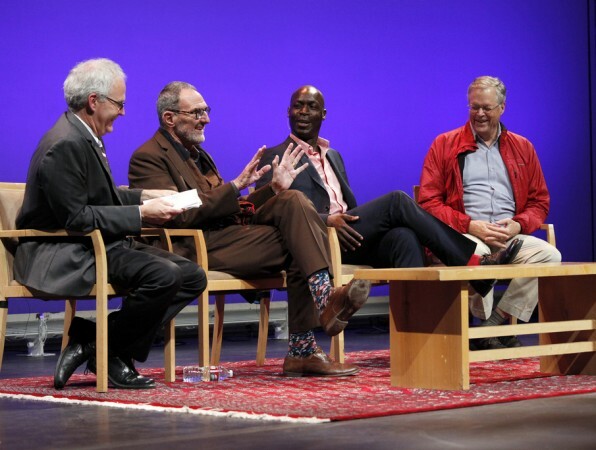 One of the great challenges of architects in Los Angeles is that no one with any political power cares about architecture, said architect Thom Mayne of Morphosis. Culturally, the role of the architect in L.A. is to make pretty objects that people talk about; the architecture, he said, can only reflect the nature of the city’s values. 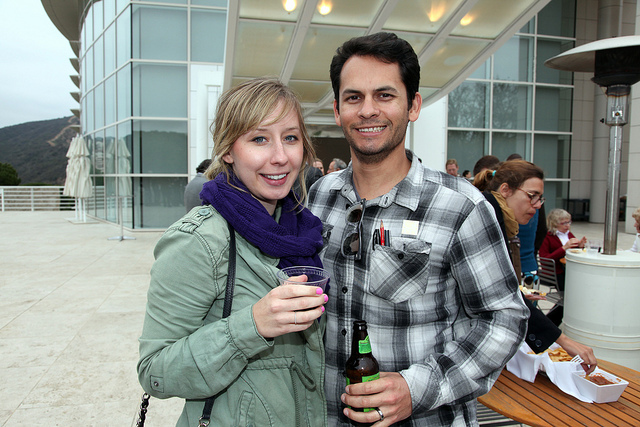 This makes it difficult for Southern California architects to be catalysts for cultural change. Architect Válery Augustin of Dn/A disagreed. “I think architecture matters,” he said. “But I think it matters in ways we as architects haven’t been able to fully tap into.” It’s not about the built form or a budget but about how a great space makes people feel—how we experience it every day. Good architecture, he said, provokes questions and makes people think differently about their cities. Project for Public Spaces founder and president Fred Kent said he doesn’t think architecture “is anywhere near as important as it should be,” but architects themselves need to focus more on the people in their buildings and how they’re using them. The field has become so rarefied and isolated—in its own tiny world—that it can be difficult for laypeople to understand it. He added that buildings need to be able to change over time, and that the future of architecture—and public spaces—is flexibility. So what, asked King, can architects do in Los Angeles to change the city? Augustin said that architects in L.A. need to figure out “how to work in these small in-between areas, the middle ground”; we like to talk about big projects like Disney Hall, but incremental changes can likewise have far-reaching implications. “I think the architecture of the future,” said Kent, “is about small-scale things,” like the base of a building bringing the street around it to life. “Your discussion is incrementalism,” responded Mayne, “which is laissez-faire.” Mayne thinks that the way cities are growing—and how large they are growing—is going to make for a more radical shift in what comes next for architecture and design. In the question-and-answer session, an audience query about beautifying digital billboards turned into a discussion about what makes for a beautiful streetscape. “We live in this radical, heterogeneous place,” said Mayne. He drives down the incredibly ugly Lincoln Boulevard in Santa Monica to get to work—but he finds Lincoln preferable to the sleep-inducing landscaped roads of Orange County that hide cars and buildings. “I really miss all that junky crap,” he said. Another audience member wanted to put in a word for iconic buildings like the Frank Gehry-designed Disney Hall, which has elevated the city. Kent responded by asking her how many people sit out in front of the Disney Hall and use it as a public space. Mayne said that Disney Hall and similarly ambitious buildings can be enjoyed simply as images that represent the city, whether or not they’re used as public spaces— especially in Los Angeles, which you see from your car. How Do People Reinvent Spaces? 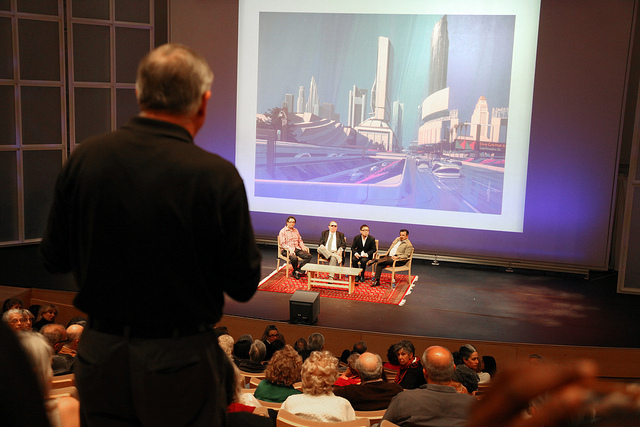 L.A.’s buildings and streetscapes aren’t the products of architects—but rather of residents, weather, immigration, social change, and history, argued members of the afternoon’s second panel. To demonstrate how change works in L.A., photographer and sociologist Camilo José Vergara showed his photographs of different buildings around the city that had changed over time. Between 1992 and 2012, the structure at 7316 South Broadway in South Los Angeles changed from a plain-white Baptist church with three crosses projected into the air to a flat-roofed building (the crosses were lost to high winds) that included both a Pentecostal church and a store offering Christian books and herbal remedies. Vergara also showed a meat market on South Vermont Avenue and 42nd Street, where a mural of Martin Luther King Jr. was transformed into a Barack Obama mural. 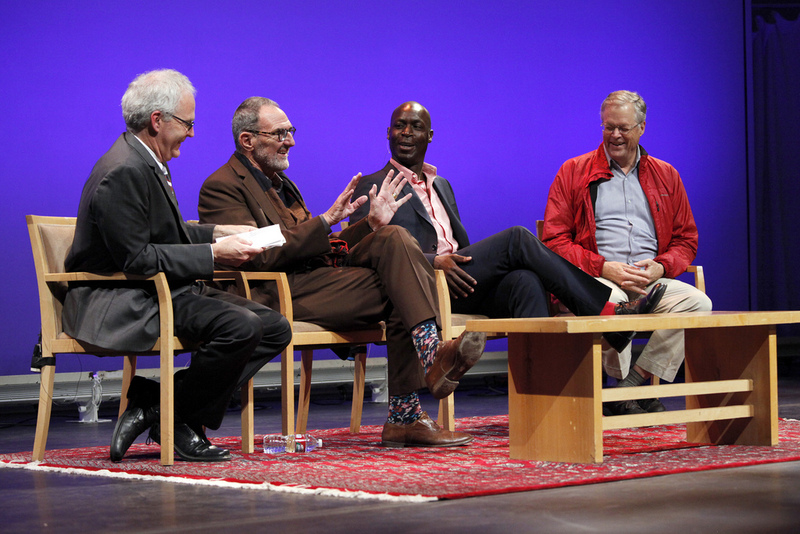 Such change, agreed the panelists, is emblematic of Los Angeles—and how architectural change really happens. The discussion’s moderator, Getty Museum educational specialist Peter Tokofsky, asked Gudis what, given all this change, she would put on a tourism poster of L.A. She suggested attractions and places that embody the city’s change and diversity—like MacArthur Park. In the question-and-answer session, the panelists were asked to make predictions about where such change would occur next. Vergara suggested that L.A.’s many alleys were ripe as spaces for transformation. Hartig suggested that people’s engagement in civic life would make changes. 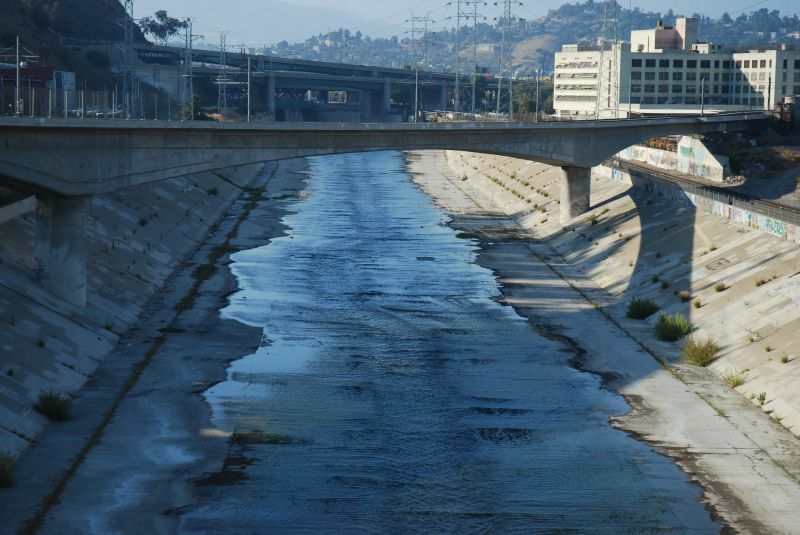 Gudis pointed to the L.A. River—revived as a working waterway after years of being ignored—as a model. Who Designs Tomorrow’s Los Angeles? Even then, your vision may be fanciful. Moderator Greg Goldin, curator of the A+D Museum, projected onto the screen a 1988 image by Mead: his vision of downtown Los Angeles in the year 2013. Tall, imposing towers flank the 110 Freeway, upon which maglev (magnetic levitation) cars drive. “Everybody loves a maglev,” said Goldin. Ma argued that while Mead’s vision may not have come to life in Los Angeles, it bears a resemblance to what has happened in China’s major cities. Visions of the future in one place can become a reality in another place. Ma said he views USC’s immediate surroundings as a laboratory for getting rid of cars, but dramatic changes in our building or living habits are unlikely to happen without something interfering with life as we currently know it. “It’s some form of catastrophe that brings the future to you,” Ma said. Rojas countered that Latino immigrants, many of them carless, have created urban communities of mom-and-pop shops on corners, within easy walking distance of residences. That, too, may be a future. All the panelists seemed to agree that finding a system in which cars can be reduced in number but kept in service all day by different users—a fleet of autos shared by everyone, essentially Zipcar-style—would be a positive development. As for what sort of places these bicycles, shared cars, or maglev vehicles will take us to—that’s still up for grabs. Ma agreed, but argued bad planning, not the act of planning, was the problem—and that lack of planning could be even worse. Even minutely planned cities, like Brasília in Brazil, have become viable as places to live. Rojas said engaging the public was essential. “If we don’t have input for our plans, then the plans fail,” he said. Questions from the audience touched on the role of parks, of preservation, and of social capital. Do Angelenos even care about what their city evolves into? No paywall. No ads. No partisan hacks. Ideas journalism with a head and a heart. COPYRIGHT 2003-2019 ZÓCALO PUBLIC SQUARE.